Thanks to everyone reading and passing on this blog. Its grown really fast and already is closing in on 10,000 hits in a little more than 6 weeks. So thank you. Helen Kilding started editing my blogs, and as you can see after a few weeks of that she really got the blogging bug herself. She’s also having quite a journey converting from low fat vegetarianism to a whole foods high fat diet including plenty of meats. Helen can speak for herself, and will continue to do so in this and subsequent blogs, but the most obvious outward thing I’ve noticed is just how healthy and vital Helen looks. Read on and thanks again. Over to you Helen. It’s over a month now since my 7 day LCHF experiment and I’ve had time to digest things (excuse the pun) and give some thought to the future. I was also lucky enough to discuss what I ate and how I felt with nutritionist Dr Mikki Williden, who kindly analysed my rather rough and ready food diary. The results were interesting, but we’ll get to that in Part 2. Occasionally I’ve had weetbix, or a bowl of porridge. I’ve enjoyed it but it hasn’t satisfied me as much. As the temperatures have dropped, I’ve started feeling like something more warming at lunch time and have been experimenting with different soups which has been nice (how could they not be when they’re laden with coconut milk and cream?!). And I’ve discovered a new favourite lunch, a kind of hot salad I guess….bok choy sautéed in lots of olive oil with a can of tuna in more olive oil, sesame seeds and soy sauce to taste. I must say though, lunches aren’t satisfying me for as long as they were at the start, possibly because I’m more active (see below). Dinner for 2 – spot the difference….. So I don’t really know how it happened, but eating LCHF has almost become a habit now and doesn’t seem any effort at all. I’m enjoying experimenting and it helps that I know so many people who are doing it as well. The last thing I want is to finally not be one sort of food freak (vegetarian), only to become another! 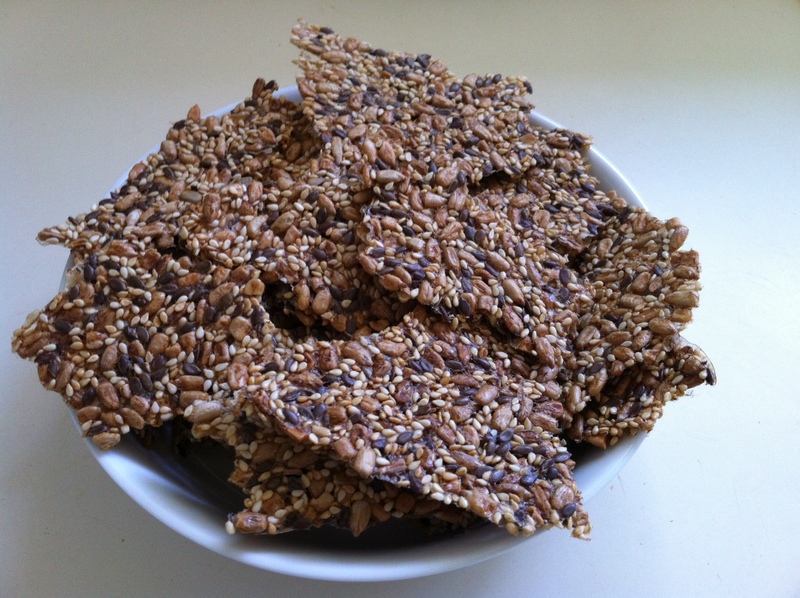 I miss the crunch of crackers, toast and chips though so loved the seed cracker recipe shared by Alex over at www.lchfchallenge.wordpress.com. Alex and her husband have just completed their own LCHF challenge which is worth a read if you’re thinking of giving it a go (comment from Grant – these are really really yummy. I haven’t got the actual skill to make them myself, but they are so good). I’ve been drinking Pepsi Max nearly everyday 😦 I can’t believe that someone so committed to their health and wellbeing puts this stuff in their body. I think it’s partly because I haven’t had any nasty side effects and partly because I don’t drink coffee or tea and really need a caffeine boost later in the afternoon (probably due to my current sleep deprived state). But I’ve decided not to beat myself up about it…I can’t and don’t want to be a complete saint when it comes to what goes in my body. And compared to what I could be doing to it, I don’t think my body can complain. I’ve definitely been more active this month, due in part I’m sure to better and more stable energy levels. Energy availability hasn’t been an issue, no matter what time of day I’ve tried to do something and no matter how many times I’ve been up in the night, which can only be because of the LCHF eating. I’ll be on fire when I finally get some proper sleep! ← Will sweeteners make you fat or sick?